On the heels of the announcement that two major trade shows are leaving Chicago, Championship Auto Shows, Inc. reveals it too is moving its annual O’Reilly Auto Parts World of Wheels show from Chicago’s McCormick Place for the first time since its 47-year history. 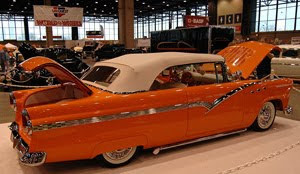 When the 2010 show rolls into town March 5-7, muscle car enthusiasts will flock to the Donald E. Stephens Convention Center (5555 N. River Rd., Rosemont, Ill.). The O’Reilly Auto Parts World of Wheels, presented by Denny Guest’s South Oak Dodge-Chrysler-Jeep is the oldest and largest auto enthusiast event in the Chicago area. Like the other events that have decided to leave, the show producers acknowledge increasing cost and customer convenience are major factors in making the decision to move the show. Toundas also acknowledges that moving to Rosemont, Ill. is easier on the customers attending the show, providing affordable and convenient valet and garage parking. Since the show began at McCormick Place more than four decades ago, Toundas has seen the price of parking skyrocket, especially in recent years. Along with the location, the show is also changing its date. Historically, the show has been in late January, one to two weeks within the new car show. This year, the O’Reilly Auto Parts World of Wheels takes place in early March, when guests can expect better weather than previous years. Historically the show has drawn thousands of auto enthusiasts from across Illinois and the United States showcasing some of the country’s most unique muscle cars, trucks and motorcycles. Last year, the show boasted the legendary George Barris who designed the original Batmobile and other famous television cars. This year, the show is happy to have Chip Foose, legendary auto designer and star of “Overhaulin” as well as a number of new show features. The 48th Annual O’Reilly Auto Parts World of Wheels, presented by Denny Guest's South Oak Dodge-Chrysler-Jeep is produced by Championship Auto Shows, Inc. of Auburn Hills, Mich. Part of the International Show Car Association custom car competition, the show takes place March 5-7, 2010 at Donald E. Stephens Convention Center (5555 N. River Road, Rosemont, Ill.). The event hours are Friday, 3 p.m. to 10:30 p.m., Saturday, 10 a.m. to 10:30 p.m. and Sunday, 10 a.m. to 7 p.m. Discount pre-sale tickets can be purchased at O’Reilly Auto Parts. For more information, visit http://www.worldofwheels.com/.